Yoendri Márquez Moya in July 2006 was convicted of being a "pre-criminal social danger," the Orwellian, catch-all crime the Castro dictatorship uses when it has nothing else to justify jailing its opponents. 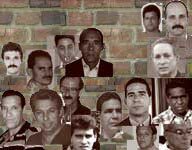 A member of Dissidents for a Free Cuba and the Frank País 30th of November Democratic Party, Márquez, when he was 21 or 22, was sentenced to 4 years in prison. Late last year, Márquez, now 25, apparently graduated to "criminal" charges of "contempt" and "resistance" after he took the occasion of International Human Rights Day on Dec. 10 to talk loudly about the virtues of the Universal Declaration of Human Rights. Guards at the Tacón de Contra Maestre prison pounced on Márquez and threw him in a punishment cell where he was forced to sleep on the floor. Two weeks later, on Christmas Eve, Márquez was hauled before a court in Palma Soriano, tried, convicted, and sentenced to 6 more years in prison, bringing his total sentence to 10 years. His wife complained that family members were not allowed to attend the "trial," and that there was nothing resembling "due process" involved in the proceedings.